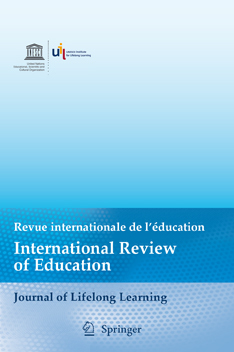 The International Review of Education – Journal of Lifelong Learning (IRE) – one of two UNESCO academic journals – is a peer-reviewed journal of education that publishes research articles on lifelong learning policy and practice. Special consideration is given to papers on adult education, non-formal education and literacy, or on formal education viewed through the lens of lifelong learning. The International Review of Education was founded in 1931 by the distinguished educationist Friedrich Schneider of the University of Cologne. He and Paul Monroe, of Teachers College at Columbia University, were its first editors. It featured articles on international comparative education in German, English and French. Notwithstanding breaks in publication between 1943 and 1947, and between 1951 and 1955, the IRE is considered the world’s longest-running journal of international education. In 1955, the journal was adopted by the UNESCO Institute for Education in Hamburg, and thus began its current incarnation. The first editorial expressed the journal’s mandate in clear terms: “The International Review of Education will provide a meeting-place for men and women from every country whose thoughts and actions deserve the attention of educationists throughout the world.” From its inception, this journal set out to address and involve not only educationists, but also researchers in other fields, as well as policymakers and practitioners of education. The Editorial Team relies on the support of the journal’s Consulting Editors to regularly review articles and solicit submissions. The composition of this panel reflects the deep expertise and broad international scope of the IRE.